MacDonald Hat-Trick cements Phoenix comeback in Gatineau! After a tough game last night against the Huskies. The Phoenix braved the cold and hit road to travel to Gatineau for their last game before the Christmas break. 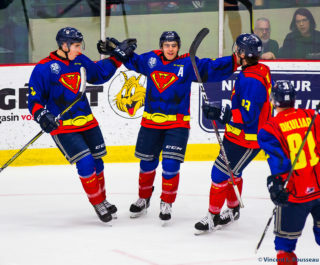 After falling behind in the game early, the Birds chipped away and battled, eventually scoring three goals in the third period for a comeback victory. The Olympiques got on the scoreboard early with a goal from Jeffrey Durocher 91 seconds into the game. The Olympiques added another two goals to take a 3-0 lead in the first period before the Phoenix could get a goal of their own. Anderson MacDonald scored at 15:45 on the power play to cut the Olympiques lead to two goals before the first break. MacDonald, assisted by Chase Harwell, was able to score after collecting the puck on a blocked shot and beating Mathieu Bellemare with a quick shot before he could recover his positioning. After trading chances early in the second, Vitalii Abramov scored to restore Gatieneau’s three-goal lead. Less than a minute later MacDonald struck again bringing the Phoenix back to a two-goal deficit. MacDonald, assisted by Nicolas Roy and Alexander Krief, scored after picking the puck out of a scrum in front of the net. The Phoenix owned the third period, scoring three straight goals to give the Birds a regulation win. 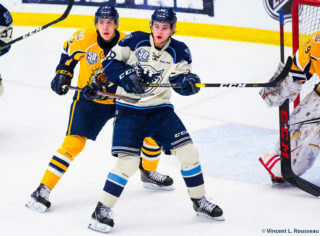 Sherbrooke’s assistant captain Julien Pelletier scored less than five minutes into the third period, assisted by Thomas Grégoire, to make it a one-goal game at 4-3. Pelletier broke into the offensive zone splitting the Gatineau defence as he cut to the middle before wiring a shot past Bellemare. 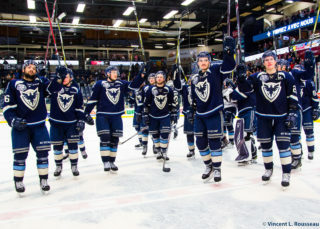 The game tying goal came off the stick of Grégoire who finsished off a great passing play with Félix Robert and Edouard Michaud. Then off a two-on-one Sherbrooke took their first lead of the game when Harwell passed the puck over to MacDonald for his third goal of the match and the game winner with three minutes to go. Sherbrooke held on for the road victory. Evan Fitzpatrick backstopped the Phoenix comeback victory after taking over for William Giroux in the first period. Fitzpatrick stopped 22/23 shots in the game. 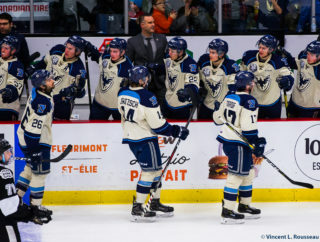 Off for the Holiday break now, the Phoenix return to action December 28th in Drummondville. However, the Palais des Sports Léopold-Drolet will host one more game before Christmas when Finland plays Slovakia December 22nd in an exhibition game for the World Junior Championships in Toronto and Montreal.